So you’ve got a trip to Thailand on your bucket list, and you’re trying to decide when to go, right? Before you call up your travel agent to ask that question, know that the BEST time to go depends a lot on what you want out of your trip, what type of traveler you are, and where in Thailand you’re headed. If you want sunny days lazing on the beach without a cloud in the sky, it’s probably best to avoid the monsoon season (obviously), but if you’re looking for lower prices, fewer crowds and cooler temperatures, the monsoon season might be a perfect fit! If you want dry days and cooler weather, it’s best to visit the northern part of Thailand from the beginning of November through the end of April. In general, the north boasts cooler temperatures overall, so if the heat is a concern, Chiang Mai should be on your list. It’s also home to some active adventures, beautiful temples, and elephant encounters, among other unique experiences, and I recommend a stop to all of my clients. 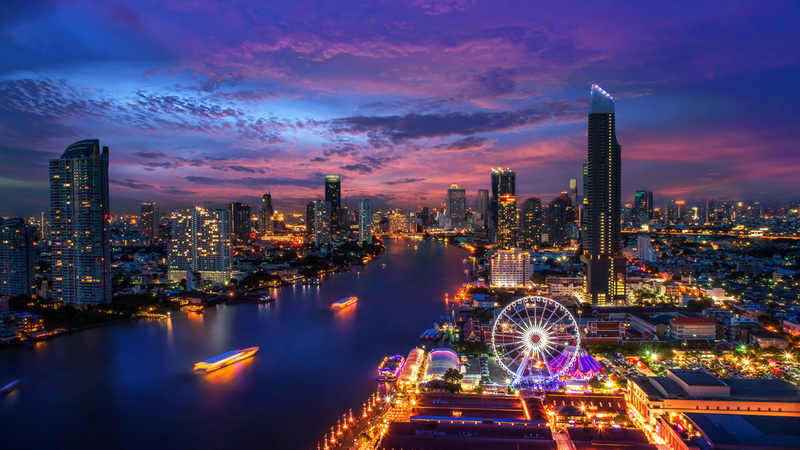 Bangkok will almost certainly make an appearance on your itinerary, since it’s most likely where your international flight will land. Since you’re there, it’s definitely worth spending a few days exploring the area, good weather or bad! But if weather is a key concern, the best time to visit central Thailand is also between November and April. Although it will often be warmer than in the north, you’ll have fewer rainy days. Bangkok does experience more rain overall than the coastal city of Pattaya (about 2 hours away), so consider spending time in Pattaya, especially during the months of June, July and August when other areas are rainier. Known as the quiet version of Phuket, don’t let its status fool you, Koh Samui is not exactly an unknown destination! Koh Samui is an island off of the east coast of the Thai peninsula, and weather patterns are much different from those above, with a shorter dry season. Rainfall can still be heavy in November, December and January, so it’s best to visit in February, March and April for drier days. You won’t see much in the way of temperature fluctuations here, so prepare for hot temperatures any time you visit. Phuket, an island just off of the west coast of the Thai peninsula, experiences weather similar to Koh Samui. with steady (hot) year-round temperatures. As a beach destination, rainfall is almost certainly the biggest consideration for your trip timing to Phuket. The best time to visit for the least rainfall is definitely late December through to the end of March. The best times to visit listed above are also the most popular times to visit, meaning that prices and crowds will be at their highest. If you want a less crowded and less expensive vacation, consider the first or last months of these prime seasons, or throw these seasons out the window and explore the fresh green of Thailand in the rainy season! And keep in mind: Your travel agent is the best resource to help find the best time specific to YOU! To set up a complimentary, no-obligation travel consultation with me, just click here, and you’ll be taken directly to my calendar!